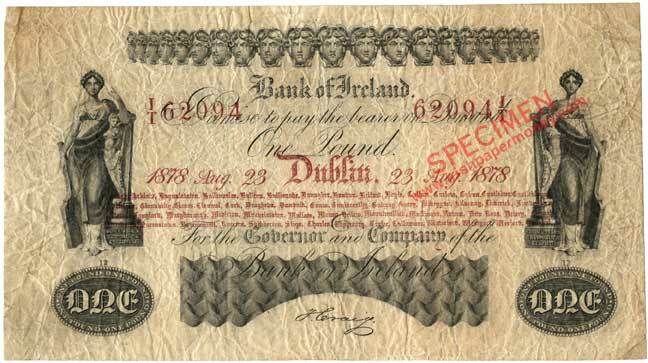 The Bank of Ireland issued Old Notes from 1783 to 1928 in Ireland. It issued Consolidated notes 1929-1939 in the Irish Free State, and Northern Ireland notes from 1929 to the present day. An early Bank of Ireland General Issue 1 Pound note 1878, the multibranch design. Why did the Bank of Ireland use a Medusa vignette on its notes? It seems like a Greek motif. They are actually not Medusa heads—catalogues that state that the are Medusa heads are mistaken—they are Mercury heads. Mercury was the Roman God of financial gain and commerce among other things. The bank also used the head of Mercury on the reverse of its 1922 issue, and on its early Northern Ireland issue. It is still lurking in the background on its current modern issues also. Thank you for the explanation! Mercury makes more sense than Medusa. When did the Bank of Ireland introduce £1 notes? The earliest date I have seen is 1801. I haven't seen one earlier than Sept 1801. Just guinea denominations from 1797 up to 1801. Very few examples of any of the notes have survived, so there's not much to go on.